If your child was born between Thanksgiving and New Year’s Day, you’ve probably encountered at least one Scrooge who considers holiday birthdays a curse or a tragedy. Remember: We celebrate birthdays to rejoice in the life of someone we love. So, focus on your child’s preferences and make the occasion memorable. Establish your own family traditions. Let your kid shine on his or her special day. Keep reading for ideas wrapped up just for you, courtesy of Playparty.net, about how to make holiday birthdays magical. H. Ann Myers advises parents to “make birthdays equal”, especially when there are two or more children in the household. Be sure to include the rituals that are part of all other family birthdays. 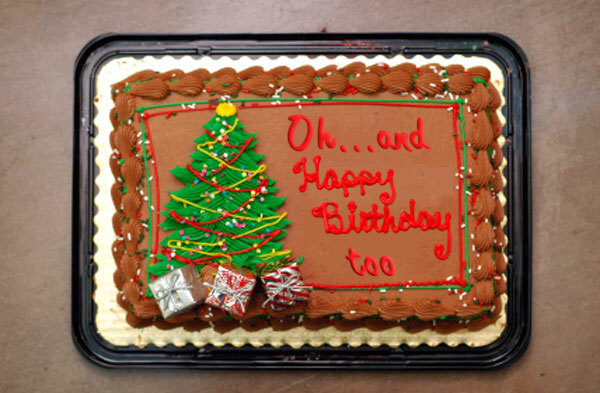 Serve birthday cake and sing “Happy Birthday”—even if it’s December 25th. Allow the birthday child to set the menu for the birthday meal. Linda DiProperzi has two rules for post-Thanksgiving birthdays: (1) no leftover turkey; and (2) no pumpkin pie with a candle stuck in it. If you’ve decked the halls with boughs of holly, create a “Birthday Zone” somewhere in your home. Linda suggests hanging banners in the birthday child’s bedroom, or putting balloons in the bathroom and writing “Happy Birthday” on the mirror. It’s not easy to plan a birthday party at the end of the year. Some of your child’s friends will be away on vacation or busy with Christmas festivities. Sarah Dees recommends “having a party a few weeks before or after the birthday” to avoid the holidays. enjoyed planning their own birthday activities. You might find that your daughter wants a June swim party while your son hankers for a backyard camp out in September. casual outing such as a visit to the zoo or lunch at a favorite restaurant. Sarah also describes a tradition of family members gathering to view photographs and home videos. Each person in turn shares something he or she loves about the birthday child. Gifts can be tricky. Some December-borns feel that combination Christmas-birthday gifts are unfair. On the other hand, receiving two rounds of gifts within a few weeks can be overwhelming, especially for younger kids. Every family eventually finds a way to resolve the gift-giving dilemma. Here are a few examples. Sarah keeps all of her kids’ birthdays “simple as far as gifts go.” With her youngest son who was born on January 3rd, she planned a family activity for his birthday and postponed gift-giving until his half-birthday in July. You may need to intervene if Aunt Mary gives a combination gift to the child with the holiday birthday while siblings receive separate gifts. Sarah suggests tactfully asking Aunt Mary to combine gifts for all of the children in the family.